In Part 1, we got hold of the Windows 10 Technical Preview build and created ourselves a VirtualBox guest machine onto which we installed it in Part 2. And it should work perfectly fine, if you can live with a low-resolution display. On start-up, my Windows 10TP guest machine was using the pre-supplied Microsoft base display driver, which, on my x86 host, would only give me 1024 by 768 in 4:3 ratio. How very 1998. So naturally, you want to install the VirtualBox Guest Additions. Unfortunately, running the Guest Additions installer crashed out at the graphics driver stage every time. then rebooting, then reinstalling Guest Additions. Live, die, repeat: you need something else to kill the space octopus. Sifting through contradictory advice from various forum posts I hit a combination of actions that finally gave me a full screen Windows 10 desktop in 16:9 wide-screen. Firstly, shut down the Windows 10TP guest; enable 3D in display settings, increase the graphics memory to 256mb; then restart the guest. Second, the Guest Additions installer has a compatibility issue with the early Windows 10 Technical Preview builds but there is a workaround to install it successfully. When starting the installer, change the compatibility mode to Windows 8 then execute the file. Right click on the corresponding .exe file ( 32bit or 64bit), go to Properties and under Compatibility tab, select Windows 8 then select Apply. If that still doesn’t give you a workable display, you may have to work harder to get the best compatible driver. where C:\Drivers can be any folder on your guest machine to store the driver files. This will extract the drivers manually to the guest hard drive. You can then choose from Windows 7, Windows 8 and Windows WDDM which is the VirtualBox video drivers for 7/Vista; it’s not great for performance but it can give you a full width Windows desktop. 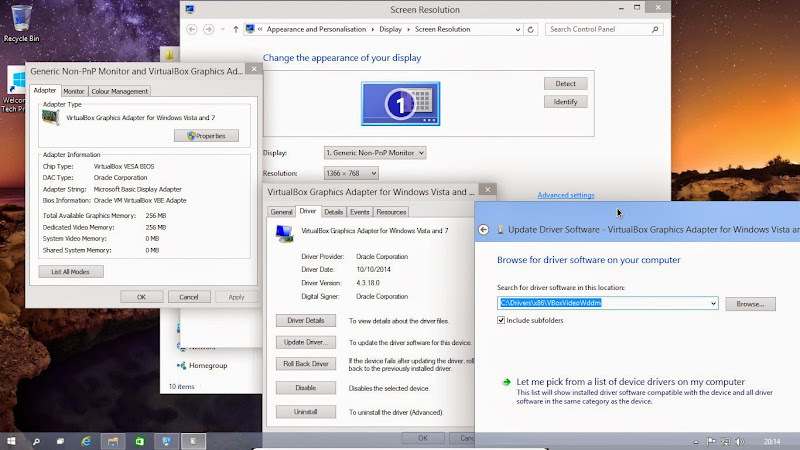 To change the driver, right-click the desktop, choose Screen Resolution, then Advanced settings, Properties. In the Properties window, select Update Driver, then choose the folder location to browse for a new driver file. You will find you have a choice of VBoxVideo, VBoxVideoW8 and VBoxVideoWDDM. To adjust the resolution, right-click the desktop, choose Screen Resolution, then Advanced settings, Properties. Thanks for the recommendations in this article – was able to get the W10TP up and running in VirtualBox.